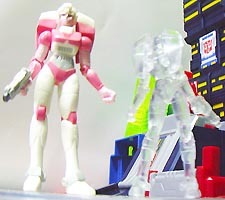 Arcee was among the first wave of Super Collection Figures, which are essentially just 8cm PVC statues. Consequently, Arcee doesn't have much in the way of articulation, gimmicks or even a transformation. Then again, she is marketed as a plastic figure, rather than a toy. And let's face it, the entire Transformers Generation One line is aimed at collectors rather than kids anyway. But until they do make a toy of Arcee (other than this statue, they've also made a few model kits) having this PVC figure will do nicely. Arcee comes with a small 6.5cm long transparent oval shaped base with the initials "S.C.F." imprinted on it, for which she can stand on. The figure sculpted pretty close to the way Arcee looked like in the animation (she debuted in Transformers The Movie). However, she sports no lipstick and her cheeks are a tad chubby. Still, it's a pretty darn good likeness for a figure that's only eight centimetres. The rest of the body feature lines and contours in concordance to the way she appears in the cartoon. Her legs, collar, head, solar plexus and tips of the two "booster packs" on her shoulders (does anyone know what the hell those things are meant to be?!) are white. Her ankles, belly and pistol (which resembles the one she used in Transformers the Movie) are light gray. The muzzle of her gun is cobalt gray. The eyes are marine blue and the rest of her is coloured with a combination of white-pink and rose-pink. There's also a red Autobot insignia painted on her chest. The two shoulder packs are dettachable and the statue actually features two points of articulation - which are the shoulders which can move up or down. However, the left shoulder joint on my one seems terribly weak. I'm not sure if this is a common problem or if it's just an isolated incident. The toy also stands with Arcee's hips sticking out slightly to her right, accentuating her feminine curvature. As with all the other Super Collection Figures, a transparent version is also avaiable (pictured above next to the coloured version). At just 480 Yen (less than eight bucks), the Super Collection Figures are a great piece for collectors. However, since they have absolutely no play value whatsoever, it's not something you'd want to buy for a kid. In fact, it's something you can't buy for a kid since, like all other Generation One toys and statues, it clearly states, "For Ages 15 and Up" on the back of the box (right next to where it says, MADE IN CHINA).